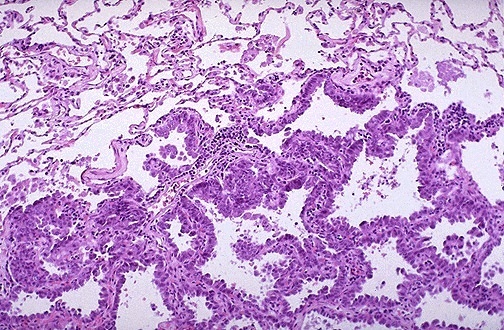 Microscopically, the adenocarcinoma-in-situ (formerly bronchioloalveolar carcinoma) is composed of columnar cells that proliferate along the framework of alveolar septae, a so-caled "lepidic" growth pattern. The neoplastic cells are well-differentiated. These neoplasms, a form of adenocarcinoma, in general have a better prognosis than most other primary lung cancers, but they may not be detected at a low stage.